Margarita Boenig-Liptsin grew up in the shadow of Chernobyl. She was born just one week after the disaster, 150 kilometers away in Kiev, Ukraine. “My mom would say, ‘You cannot play under the trees because [of] the radiation,’” she remembers. The social consequences of the Chernobyl disaster, she said, were the foundation of her interest in Science, Technology, and Society, or STS, an interdisciplinary field that focuses on how scientific knowledge affects culture and politics. Boenig-Liptsin is currently a postdoctoral fellow in the STS program at the Kennedy School of Government, the primary institution for the field at Harvard. At the same time, STS at Harvard lacks what would be expected of an academic field: formalized degree programs, dedicated coursework, and a general sense of institutionalization. As such, STS affiliates said they are worried that Harvard is falling behind its peer institutions in the field. A recent push for administrative changes centered on a Ph.D. program, and although progress has stalled, supporters continue to press for change. “It’s a story of innovation that wants to happen, and then there’s some structural and institutional blockages that prevent it. And it’s very sad. Because I think this field is really essential for a 21st century education,” Boenig-Liptsin said. Active and globally recognized, Harvard’s STS network is seeking to ingrain itself into the University’s academic structure, striving for a Ph.D. program to produce scholars and teachers for Harvard and beyond. Affiliates of Harvard’s STS program have recently advocated for a Ph.D. program in their field, which they consider a vital step in its development at the University. The current STS network emerged out of a program started in 2002 by Kennedy School professor Sheila S. Jasanoff ’64. It hosts a fellows program, well-attended weekly meetings, a high-profile lecture once a semester, a secondary field for graduate students, and an international network of young STS scholars. Through the program, Harvard is world-renowned for its rigorous and intensive STS research, affiliates said. 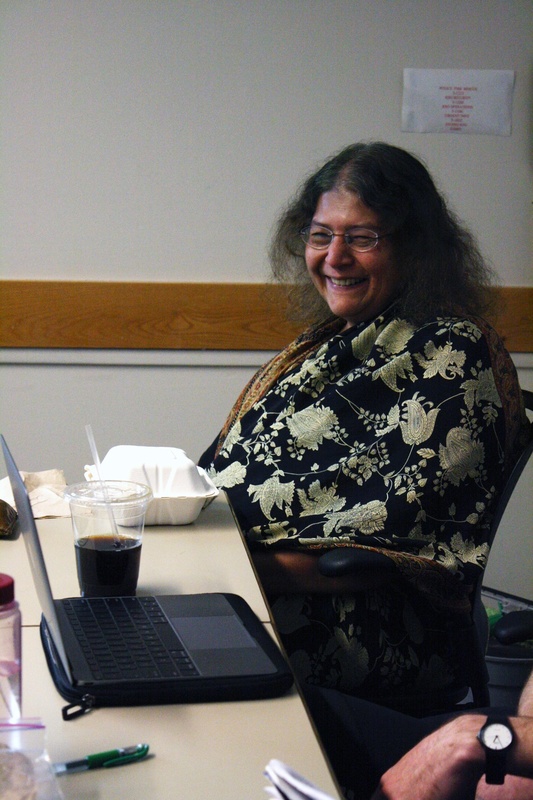 Professor Sheila Jasanoff ’64 leads a weekly meeting about Science, Technology, and Society on Tuesday, Nov. 17, 2015. While Jasanoff has about two dozen faculty members across five University schools supporting her program, she goes to enormous lengths to keep it going. Bran S. Shim ’15, who took STS courses as an undergraduate and hopes to pursue a Ph.D. in STS, called her efforts “Herculean.” Even so, the program lacks what many STS scholars would call integral to an academic field at a top research university: a Ph.D. program. Such a program is a logical next step in the development of a network of undergraduates, graduate students, and faculty members for STS. “In the ideal case, that whole ecology is in place,” Jasanoff said. As such, STS affiliates have pushed to place the field more squarely in the academic fabric of Harvard. 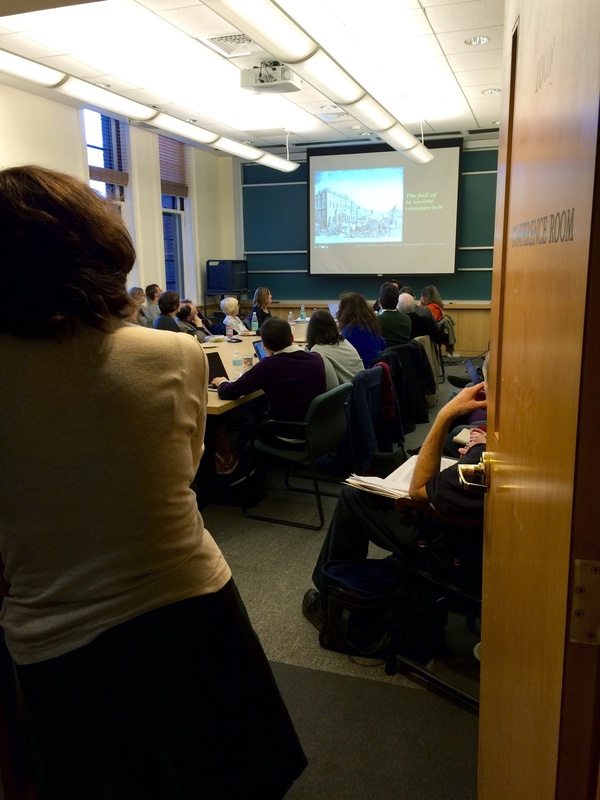 In 2013, Jasanoff and two dozen faculty supporters presented a Ph.D. proposal to Xiao-Li Meng, dean of the Graduate School of Arts and Sciences. Faculty members met with the Graduate Policy Committee, which is responsible for reviewing graduate programs and considering Ph.D. proposals. More than a year later, they were notified that the committee voted against the proposal, according to Jasanoff. In an emailed statement, Meng wrote that the proposal was “considered carefully” by the committee, and that the deans’ offices of GSAS and the Social Science division of the Faculty of Arts and Sciences are currently in the midst of ongoing discussions regarding the future of STS. Last spring, graduate students got involved independently of the faculty effort, compiling a dossier of about 150 letters from professors and students around the world about the impact of STS on their intellectual development. The purpose of the letters was to “call on the administration to take the steps necessary to ensure the future of the field at this university,” according to the cover page. The group then met with Meng last May. Those involved in the effort have not heard of any conclusions or deliberations from the Graduate Policy Committee, according to Boenig-Liptsin. “What’s frustrating for me is to see the enormous amount of demand and support in the rest of the world, and to see how little it would take for Harvard to meet that demand, and to find that that’s not happening,” Jasanoff said. Despite the lack of progress in the last year, STS affiliates have continued the Ph.D. program effort, pointing to benefits for the University’s stature and students. Graduate students specializing in STS are vital to providing the right experience and perspective in teaching the field to undergraduates, according to program supporters. Without graduate students, professors of STS-related undergraduate courses have a difficult time finding qualified teaching fellows, they say. Professor Venkatesh Narayanamurti, who was the founding dean of the School of Engineering and Applied Sciences, taught an STS-centered course, Science of the Physical Universe 24: “Introduction to Technology and Society.” Because he did not have enough TFs with the necessary background in STS, enrollment had to be cut from 139 interested students down to 35, he said. His only TF with a Ph.D. in STS came from a Danish university. Students and faculty attend a talk about disease in Marseille, France at a weekly meeting about Science, Technology, and Society on Monday, Nov. 16. “I’m looking for people who can cross the divide. Usually I’ve had to recruit these people from other places. 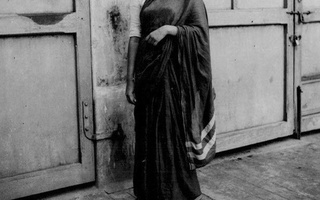 Sadly, Harvard is not producing them,” Narayanamurti said. Many American institutions now have degree programs in STS, including Cornell, Stanford, and MIT. STS is one of the top five most popular undergraduate majors at Stanford. Charles G. Gertler ’13, a graduate student at MIT who took STS courses as a Harvard undergraduate, said the University, even with a strong STS program, should catch up to the preeminent institutions with which it competes. A Ph.D program would focus more attention on bringing faculty members focused on STS to campus. Although many professors—particularly those in the History of Science department and the Environmental Science and Public Policy program—list STS as one of their areas of research, Jasanoff said she is the only faculty member whose main focus is on STS. Shim said new hires need to be made. A more specialized and dedicated faculty would be the ultimate goal for STS at Harvard, but to STS affiliates, the main obstacle is the perception that such a faculty is already here: the History of Science department. Indeed, on the department’s website, STS is listed as an area of research for eight faculty members. The issue is not with an underappreciation of STS as a field, but rather in how distinct the two fields should be. History of Science professor David S. Jones ’92 said he recognizes the importance of STS, but called for a “big tent approach,” in which STS falls under the umbrella of History of Science. “I’m still convinced that people who want to do good work in STS could do it through existing mechanisms in History of Science or Anthropology, as long as the relevant faculty exist,” Jones said. But supporters of a distinct STS field said the History of Science department lacks the contemporary lens through which STS often looks at issues, and thus cannot be home to the field as a whole. “I don’t think that there’s a neglect of the present in the History of Science department, but I do think that STS offers a different set of tools,” said Daniel Z. Wilson ’14, who was involved with STS as a History of Science concentrator. Jones said that while STS could fit under the umbrella of History of Science, the department is still limited in the field currently. “If you were to take Sheila out of the question and say, ‘Could the History of Science department adequately prepare people in STS?’ I would say no. I think we’re weak there,” said Jones. Ultimately, an STS network grounded more firmly in Harvard’s academic structure would affirm the University’s commitment to a liberal arts education among its undergraduates, STS affiliates said. Bridging seemingly disparate fields, STS is an example of the interdisciplinary nature of modern higher education, they argue, and STS supporters said Harvard may lag behind some of its peers in this regard. “There’s a risk that Stanford eats our lunch because we’re not getting our hands dirty,” said Jackson S. Salovaara ’11, who was involved with STS as an undergraduate. “We consider that a really important mission for us, to expose our students to the traditions, insights, and legacies of STS. I hope that happens at more places, including at Harvard,” she said. Supporters said they are optimistic about a greater undergraduate presence for STS as they follow the discussions around the review of the College’s General Education program. “I’m hopeful that the Gen Ed review will produce a recognition that this particular form of interdisciplinarity…is something that is hugely significant for the training of future citizens and future scholars,” Jasanoff said. Many STS supporters said they were surprised at how challenging it has been to develop the field at Harvard, given how well they feel it fits into the University’s values.